If you’re on the road toward smart energy efficiency and have an attic, attic tents need to be in your workbook. Through the years, homeowners who have been aware of air transfer/loss through the attic have attempted to remedy it by placing insulation around the attic door opening. Unfortunately, this technique doesn’t provide an air tight barrier, therefore, little reduction in the amount of energy waste and air loss is achieved. It also creates harmful airborn particles of dust and fiberglass each time the attic door is opened or closed. This video by Atlanta-based KTM Energy Wise provides a very logical and useful foundation for understanding one of many versions — depending on the entrance to the attic — of the attic tent. Measure how high the attic stairs are above the rough frame. This lets you know the height of attic tent needed. See sizing and installation information for the product. Measure inside width and length of rough frame. 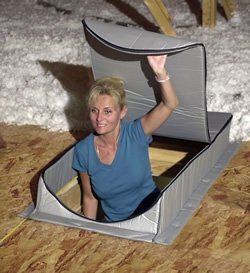 Place your attic tent with the zipper heads at the hinge end of the attic stair box, ensuring an easy reach. Staple the mounting flange to the rough frame, on all four sides about every 2 -3 inches. Seal between mounting flange and rough frame with a bead of caulk. Vertically align attic tent to back side of door frame. Make sure the zipper end is down. Fold flange under zipper side to attach to the floor. Staple around door frame on attic side and seal with a bead of caulk. There are other kinds of attic tents which can be used, depending on how your attic access has been configured. 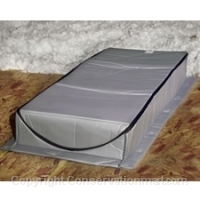 Before ordering your attic tent, make certain you have selected the correct product. According to the EPA, a home’s attic access, which could be an attic hatch, pull-down stairs, or a knee-wall door, often, goes uninsulated. This gap in the attic insulation increases heat loss in the winter and heat gain in the summer. A 1/4-inch gap around the perimeter of an attic access can potentially leak the same amount of air supplied by a typical bedroom heating duct. By air sealing attic access, you can significantly reduce heating and cooling costs. Enjoy this simple, inexpensive, and important step in making your home more energy efficient!